Wow im very intrested please post more pics. I have 2500 sq foot home and have a water heater going out as we speak and plan to replace i liked the polaris model to. My forced air furnace is from the 80’s and also needs replaced.I’ve been thinking about making a system like yours with the assistance of my old furnace shell and parts. I’m just looking at a savings standpoint of not having to purchace a high efficent furnace and water heater. I think it might save me more money to have only one gas hog in the basment instead of 2. What do u think?????? I am a very skilled maint. man and should be able to do most if not all of the work my self. If u have any more info i’m hungry for as i will have to purchase a water heater very soon. And so tired of paying high gas bills on a home built in 1911. TY Dave………..
@David: I’ll see what I can do for you in terms of providing more detail/pictures in another post. There’s really not a whole lot involved in the system as it’s literally just a Taco circulator pump that draws hot water out of my Polaris hot water tank. This water is then fed through the heating coil that is inside my plenum and returned to the hot water tank. My thermostat is connected to both the blower on the original electric forced air unit and on the switch to turn the circulator pump on. When there is a call for heat, the Taco circulator pump turns on and then the blower. The hot water tank only burns when it’s detected that the water temperature has dropped below it’s set point. The system works fairly well but it’s best at maintaining a constant temperature. It’s not really able to raise the temperature in the house quickly. Thanks for the info given. I look forward to your future posts and plan to purchase the water heater very soon.I think this will be a great addition to my home. A constant temp is just what i need. Also how well does it do when the ouside temp is close to zero can the unit keep up or do u have to use an auxzillary heat as i live in OH and it does geet verry cold sometimes.?????? Take a look at my new post Hydronic Heating Coil Sizing for some more information. As for outside temperatures, we’re in eastern Ontario and during the winter we often get temperatures in the -25° C range (about -13°F). Those are the days where the system has a hard time keeping up. It can usually maintain the temperature but if we have a couple days like that and strong winds, it can be a little cool in parts of the house. A question about your system. What triggers the blower fan to turn on? Is it purely the temperature in the plenum? I ask because I am thinking of putting a water to air exchanger (like yours) in my gas forced air furnace plenum and “powering” it with solar hot water. Problem is, I want the blower to come on in response to the heat from the exchanger without the gas blowers coming on. What do you think? @ R. Beck: In my system, the blower is the original blower in the electric forced air furnace. It is turned on by the demand for heat from the thermostat. The circulator pump is also turned on when there is a call for heat. I’m not sure if anything was done to the blower controls but the blower does have a delay versus the circulator pump when there is a call for heat. I’m not sure I understand your plans. If you are going to add a second blower, you should be able to get some sort of control that will only turn on that second blower when there is enough heat in your solar hot water coil. I’m not sure where you would find anything like that. Even then, by having a second blower in your plenum, you could cause problems with airflow in general. great article. My 50 Gal Polaris water heater just died and I’m stuck with replacing it. We just purchased our home and the Polaris water heater was from 1991. Could you clue me in as to where you purchased yours from? Also, can you give me a clue as to where you got your heating coil from too? I really love the heat that this system produces! Tim, We don’t actually own our Polaris tank. The previous owner of our house was renting the tank from Direct Energy (associated with Enbridge, our natural gas provider) so we inherited the rental. Getting our replacement heating coil was an adventure! In the end we discovered that a neighbour of ours worked for a company that also sold outdoor wood furnaces. Our neighbour was able to get us the correct size coil for our application. I’d recommend tracking down a local wood furnace company to see if they have coils or can get coils. The price of ours was better than any others I could find and half of what other local heating companies wanted to charge. If you haven’t already, take a look at the post Hydronic Heating Coil Sizing which is a follow-up to this one. I have some more information on how I found the right coil for my system. Like R. Beck I’m interested in running solar-heated hot water through a hydronic water coil (in an air handler) to heat the house in a forced-air system, which in South Louisiana, will be used much more for AC than heating. How efficient is the water coil? Can it heat the entire house? What is the incoming water temperature with your system. Do you supplement with electric or gas heat when it’s really cold? If necessary, I could supplement the solar heated water with a gas demand heater before it goes to the air handler. I live in Louisiana were we now have a 50% tax credit for solar systems, plus the 30 percent federal credit. I.e., a $20,000 system should only cost me $4,000. Any idea who makes the best equipment? Jim, The size of the water coil and the incoming water temperature are going to be the two main factors in any hydronic heating system. The flow rate of the water (Gpm) will also be a factor but I’m not sure if it’s as important. My system runs at 60°C (140F) and based on the size of my coil, it’s capable of producing about 77k BTU. You’re going to have to know how much heating output your system needs. If you’re replacing an existing heating source, make note of what it produces as that’s probably a good starting point. I had an electric forced air unit that was able to produce 66k BTU so I was lucky. I also was replacing an existing water coil that I knew the dimensions of. If you haven’t already, take a look at my Hydronic Heating Coil Sizing post as I covered the specifics of my system. As for solar, I would not recommend a pure solar hot water heating system. All it takes are a couple days of overcast weather and you don’t have a reliable heating source. Most simple solar hot water systems I’ve seen on the web have two hot water tanks. One tank for the solar hot water and a second electric (or gas) tank to “top-up” the water temperature. The solar heated water is dumped in the storage tank and then fed into the “cold” water intake of the electric hot water tank where it is brought up to the set temperature (if required). Electric tanks in my neck of the woods are much cheaper to purchase, and install than gas so if you don’t already have a gas hot water tank, don’t bother getting one if you’re going to use solar. Since it’s basically a backup, the cost of running and electric hot water tank would be quite low compared to a gas hot water tank. You could also run an on demand hot water system instead of a second tank. This may not cost much less though as on demand systems are still a little on the expensive side in my opinion. For a lot of solar hot water information, check out Build It Solar. Gary Reysa has compiled a huge wealth of information on everything solar and I’d only be repeating what he has already said. I have an 1890s house which has no central air or heat (gas floor furnaces and gas burners in the fireplaces for heat; window units for AC). I need to install central air/heat so I’m starting from scratch. While I wouldn’t consider a hydronic coil but for the solar tax credits, those credits are impressive. I have a Takagi demand heater which I can use to bring the solar preheated water up to temperature if needed. I read your post on sizing the coil and have a little concern about maintaining the temperature. Our average winter lows (Dec-Feb) are in the mid-40Fs (8C) and the coldest record lows are in the upper teens (-8C). On the other hand, if can be 80F (25C) one day and be 45F (7C) the next. Typically, we get into the 30Fs (0 to 5C) only a few times a year, get a freeze once or twice at most, and get a hard freeze once every few years. You said a setback thermostat wasn’t really useable due to slow recovery times. As recovery depends in part on how cold it is outside, can you estimate recovery time if it’s 50F (10C) outside and 60F (15C) inside? How long does it take to bring the temperature up to 72F (22C)? Do you need supplemental resistance heating to get the job done? Do you know if there are sophisticated electronics that can monitor those kinds of issues? (E.g, variable speed blowers depending on incoming hot water temp? sensors to say when to run the water through the demand heater to boost the temp or when to kick in resistance heating? sensors to change the flow rate? If I’m using solar, my heating load will be greater at night when I have no sunshine. So I’m likely to need some supplemental heating source, probably the demand heater. One more question. Have you ever tried running cold water through the coil in the summer to get some air conditioning and/or dehumidification effects? Given that your temperature doesn’t get nearly as cold as here, I doubt you’ll have any problems with maintaining something like 22°C. We keep our house at 22°C and as I write this post, it is currently -6°C. Tomorrow night the low will be a more typical -17°C. During the day from December to February, we don’t usually get back to the freezing point so we’re always trying to keep the house about 30°C warmer than outside (on average, best guess). We don’t typically use any other active form of heating. We do still have the electric coils in our forced air unit but I only turn them on when something happens to our hot water tank and it needs to be serviced. We do get a fairly substantial solar gain in the front half of our house due to a very large front window. Unfortunately, that also means we lose heat faster once the sun is gone if we don’t get the drapes closed. I’m going to guess that you could find any sensor you want. I haven’t really looked for anything like what you are looking for as my system is tied into the existing controls for the old electric forced air unit. When there is a demand for heat, it turns on the Taco circulator pump which draws water from my hot water tank. It also turns on the blower. The water is pumped through the heat exchanger and returned to the hot water tank slightly cooler. The hot water tank takes care of maintaining the temperature of the water in the tank (60°C). I’ve never tried putting cold water through the system but that is simply because it would require a lot of plumbing work to allow me to switch back and forth. Since my heating system is directly tied into my domestic hot water, I’d also need a renewable source of cold potable water. I don’t want to draw gallons of cold water per minute off of our municipal water line only to then dump the warmer water into the sewers. I have ideas on how I could do it but most involve ripping up my basement floor to install 1000+ feet of pipe to use the ground to cool the water. Solar systems can exceed 60°C quite easily in climates colder than yours. I think if you had a sufficiently large storage capacity (100G at least) you should be able to produce a substantial amount of hot water in an average day. Gary Reysa of Build It Solar is in Colorado and has a lot of data on his personal solar heating systems. It’s worth digging through his site for a couple days if you are seriously considering solar. I have used a similar system for the last three years but use a commercial grade Rinnai hot water on demand heater. I used to have and outdoor wood boiler so I was pretty much set up already. It is the only heat we have to heat 3000 square feet. Jeff, do you use a zone valve in your system? Nope, no zone valve. Our system is very simple. It’s a single loop from the Polaris hot water heater to the heat exchanger in the plenum. We’re only heating about 1800sqft so it works reasonably well. It would be nice to have zones in this house though. Reading about your story and experience with Polaris, looks a carbon copy of my saga: Inherited Polaris system from previous owner, the same rental company and service, the same problems and thoughts to replace Polaris, because it keeps braking down (DE had to visit us 3 times last winter), almost everything that could be replaced is replaced (lucky that the unit is rented), all the heating and cooling contractors tried to convince as to replace the system with “regular” one, I had a thoughts to install assisting solar, but give up the idea – the same reasoning as you (yours calculations were very thorough), the same hot water coil leak, a Specialist came and after 2h sweaty work and $200 the pinhall reappeared in 2mo, than for the last 2 winters the leakage was managed with 5c rubber washer and a bracket. Unfortunately, the spot is very tricky (first joint to the coil) and now the pinhall grew to a decknail size, all my attempts to keep the coil viable resulted to undesirable dripping. I am having the same problem finding a coil, the suggestions I was given “replace the system”. At this point my story turns to other direction – I do not have the same neighbour. I am not sure, if there were any possibility to get some help from your neighbour? I could not find in the WEB a company in Ontario that offered such a thing, all companies that appeared were in States. We are living in Toronto and the size of my coil is 16x16x3 in. Could you give me any suggestions? Nick, unfortunately I don’t know of any company in Ontario that sells via the web. I do know that the local company I called gave me an insanely high quote on a coil that wasn’t even the correct size. If I hadn’t lucked out with my neighbour, I would have bought from one of the companies in the USA simply because it would have been hundreds of dollars cheaper, even with shipping. The Canadian dollar is pretty high right now so it can work in your favour to by from the States. The best source would be a company that sells wood furnaces. I just did a quick search and Green Valley Heating is in the 519 area code. They might be able to help you find a coil “locally”. Man I could copy and paste Nick and your story Jeff. Same issues. Polaris system. 16 X 16 inch heat exchanger thats been leaking for 5 years and I’ve been band-aiding ever since. Its 14 years old now. It was installed when the house was new and I’m the original owner. The rest of the neighbours have all had theirs ripped out and replaced with stand alone water heaters and furnaces. I’ve never had a problem with heat, just that it leaks all the time with these silly pinholes that you can’t get at. But now I’m trying to replace it and have been Googling for weeks. What I’ve found is just what you talk about, outdoor wood furnaces. Theres a place in the states I found on e-bay called freeheat4u and their prices are good. I had a quote to make one locally just like mine that came in at $436.00. From the states, 165.00 CDN. plus shiiping. Just need to do some reworking with the plumbing as Jeff did. I’m still waiting for the part to arrive but I’m sure everything will go fine. I doubt you’ll have any problems installing the heat exchanger. Hell, I managed to do it with a fair bit of 3/4″ plumbing work and I have never in my life done anything plumbing related. If you’re in the same boat, it’s worth looking on YouTube for some of the videos that show how to get a “proper” solder joint on copper. I followed the tips in one of the videos (make sure everything is clean and dry) and it worked very well. I happened to look at my joints just this past weekend and they still look fantastic (nice shiny solder) and no leaks at all. Where did you purchase the 1″ to 3/4″ adapters for the copper tubing to the coil?? Is that like just a Home Depot thing?? Oh, check prices in different stores for the stuff. I think for me at the time the 8′ of 3/4″ I needed was cheaper in one store and the 1″ to 3/4″ reducer was cheaper somewhere else. Copper prices have come down a fair bit though from when I was doing this. If you don’t already have a torch, consider getting a burner that can use MAPP gas. Burns much hotter and makes working with the 3/4″ and 1″ copper easier. I did it with a propane torch but it took a long time to get all the copper up to temperature. http://www.flickr.com/photos/[email protected]/3915337816/in/set-72157622354361008/, I will try to prepare a *.pdf format file with the photos for easier viewing and downloading (I will post the link when it is ready). 1. Do not use a sweat elbows and connectors, it looks easier to work with them, but when you clean the endings and apply the flux it is very hard to put them together. 2. There are copper tubes with two different wall thicknesses, use the thicker one. 3. Make sure to flush the system from the derbies, they are a lot in any coil, but after assembling everything, you do not need any water and moist prior to soldering. 4. In my case, probably in yours the system is designed without expansion tank and I assumed that the coil is doing the work, so install a vent valve at the highest point of the system, to get rid of any air. I will connect my valve to the humidifier (which is a must in the winter), hopping that will take some pressure off the coil. 5. 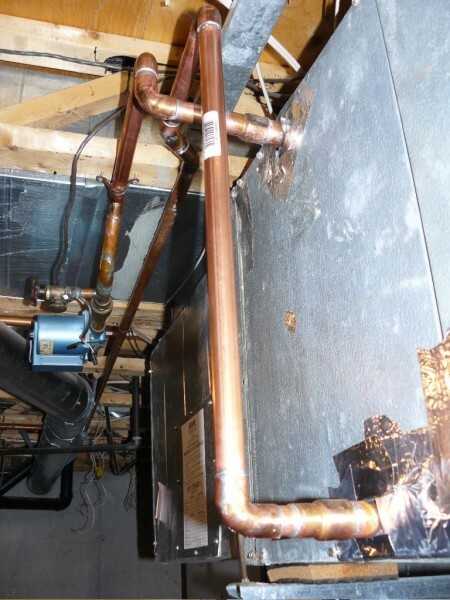 To prevent corrosion, make sure that copper tubes are not in contact to any metal parts from the airhandler. 6. I used Shark-bite connectors to connect the coil in case I had to take it out (hope not to be necessary). About the pricing the coil cost me just over $300, adding the price of some tools and plumbing parts, plus travel to Stratford and visiting Pinery Provincial Park and a lunch, I do not thing it was more than $800. Not bad comparing to replacing everything from $10000 to $15000 depending on the efficiency of the new equipment. For this year you can get government and provincial tax rebate close to $2000, but I do not think it really worth spending so much if you can fixed for less. Only for information, I got a quote for heatpump installation over $17000, the latest models from Mitsubishi suits well the cold Canadian climate and probably will be close future preferable choice, if the price dropped. Nick, thanks for the fantastic summary and the pictures! Your system is much more compact than mine is. 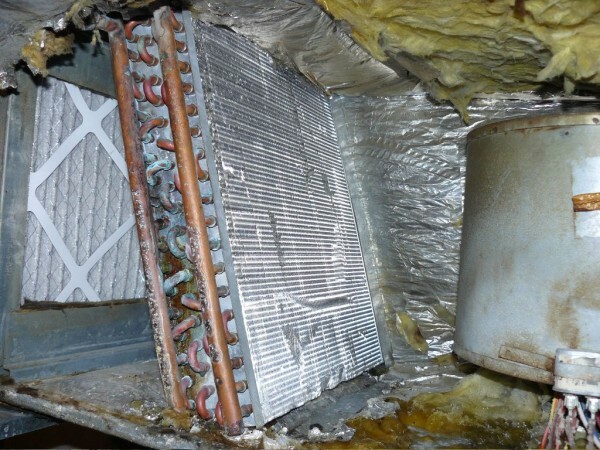 Out of curiosity, did you try to contact the manufacturer of your air handler for a replacement coil? My system wasn’t an actual air handler so I had to source everything myself. I’m still trying to design a solar-assisted hot water coil system (see above) and have a couple more questions. If you can help, I’d appreciate it. In an earlier post, you said your water heater is set to 60C (140F). Is there a BTU rating for your system? Do you know what the water temperature is coming OUT of the coil? I.e., how much heat is taken out at the coil before the water circulates back into the heater? If it goes in at 60C, does it come out at 50C (122F) or 40C (104F) or what? This will help me decide if I want to loop back into an 80 or 100 gal solar storage tank and/or have a smaller loop just for the hot water coil. Also, how many gallons per minute is your Taco circulating pump? For the outlet/inlet temperatures, I don’t have an “easy” way to determine that. At best I could probably figure out what the copper surface temperature is and maybe there is some correlation to the actual water temperature. The only temperature control I have is on the Polaris hot water tank. I’ll see if I can dig up more information on the Taco pump. If I remember correctly, it’s a pretty low flow pump. I think it ends up being less than 10GPM in my installation because it has to draw water up to the ceiling from the tank. Let me see what I can dig up. I might just munge it all together into a new (more concise) post. A ballpark outlet temperature should be fine. My guess is it’s probably going to be a 5C to 10C drop rather than 15C to 20C drop. You can probably get a good estimate by feeling the outlet pipe with your hand (carefully). 60C is going to be too hot to hold for more than a second or two. 50C is the standard factory hot water heater setting. It will be very hot, but you can probably hold the pipe for 10 or 15 seconds before it gets too hot to hold. 40C is like a hot bath. Jim, I pulled together some numbers. Check out my Hydronic Heating System Information post. Nic, your comment about hard water makes a lot of sense. We also have very hard water (town supply but it does come from a well) and prior to our water softener finally rupturing, I don’t think it was working correctly. It’s been a couple years now and everything is still working well (knock on wood!). Here’s what I’m thinking for my system, some of which may also be of interest to Nic and others. I’d get an 80- to 100-gal storage tank for the solar system, but get one with two heat exchanger coils. The first one (probably the lower coil) goes to the solar panel in a closed loop system to heat/preheat the water in the tank which goes to the house for showers, cooking, dishwasher. Closed loops allow the fluid to have some sort of antifreeze for cold climates. The second heat exchanger coil connects to the hot water coil in the air handler. If this was a closed loop system, the water in it could be soft water to help eliminate the pinhole problem with hard water. There may need to be some sort of expansion tank give the high temperatures in winter and low temperatures in summer in the hot water coil loop. The hot water coil loop would have a demand heater in it to make sure the water temp for the forced air heater was high enough when there was low heat from solar or high heat demand in winter. This loop could also provide supplemental heat for the domestic hot water (DWH) system. Close a valve to the hot water coil and use the demand heater to heat the storage tank. Another option is to have the loop to the hot water coil not be a closed loop. This way, DHW could also run through the demand heater to get topped up. It would also reduce standby losses if the tank mostly stores solar heat rather than electric- or gas-generated heat. In a more complicated system, I’d like to use thermostats, variable speed circulation pumps and air pumps so as to “milk” as much heat out of the solar heater water before using gas or electric to supplement. And once I’m using only the supplemental heat source, I’d bypass the coil in the tank and just reheat the water in the coil loop. Anyway, thanks again for the info. It should help me figure the best way to set up a system. Jim, if you haven’t already, check out Gary Reysa’s $1000 Solar Water Heating System. It’s a system he built himself but the concepts and system design are really great. Gary has boat loads of information on solar hot water (and more) on his site and it’s where I go to learn more and dream. :) I’d really like to install solar hot water to supplement my existing system but I just can’t justify the cost as it doesn’t payback in a reasonable time for me. Maybe when gas and electricity prices go up 10x it will work but then hopefully solar systems will be half the price. I read Jim’s post about his system and I had some thoughts to share. I have been working through a design with a local company to install a solar hot water system, and then would also like to supplement my main forced air with a few more panels through the use of a hydronic coil. In the discussions with the installer, I’m a little apprehensive since it seems I might know as much as they do and possibly more. They had done these installs more often in the 80s. Originally they mentioned pre-heating the cold air return with the exchanger. Being new to this, I thought that would be a possible good option. It seems though my furnace only can accept a return air temp maximum of 85degrees. I don’t think this method will work because of that and also it seems that this may not be the most efficient way to use the hot water. After reading more about systems like this, it seems most people are installing the coil after the AC coil. I would put in a controller on the pump to only pump the hot water to the coil when the furnace is asking to turn on and then only if the temperature of the water is high enough, allowing the hot water system to be the sole heat source by putting a bypass switch onto the furnace to have the ignitor stay off and just have the blower running. If the water temps aren’t high enough, the gas furnace functions as usual. My local installer is initially saying we’d use a closed loop system based on the same plumbing as the solar hot water collectors, but there would be a junction that would send a percentage of the glycol mixture to the hydronic coil. I believe the closed loop system would tend to be have longer longevity because of no hard water issues.. This would mean that my space heating with such a system would only be active during the day. Having around the clock hot water heating isn’t a huge issue for me, but I wanted to understand what problems there might be with using the glycol mixture directly in the closed loop system. Am I destined to little benefit using a setup like this? Most are using the hot water from a tank so I keep wondering if the setup mentioned here is not very effective. One thing that also is hard to come by is how efficient is using the solar hot water to space heat and what maintenance should I expect with such a system? I ran across this post while serching for a coil.This information should help clear up some of the questions.For proper heat transfer through coil, water velocities should be min 3 ft per second max 5 ft per second .You mentioned well water,city water ph is generally maintained around 8 by adding limestone,well water sometimes untreated is very acid.Copper pipe is soluable at a ph below 6.5.Also pumps located less than 10 pipe diameters from changes in pipe size produce cavitation.Fluid velocities in excess of 5 ft per second on hot water basically wash the pipe away. This should explain the pin holes. I’d like to think that who ever installed the system ~15 years ago in my house knew what they were doing. Considering how difficult it’s been to find anyone local who even understands what I’m talking about, I’m guessing it either wasn’t anyone local or it was someone who is no longer in business (for one reason or another). Could you post the pic of the sharp-bite connector connecting the coil? I am in the same situation of need to replacing a leak heating coil of my air-handler in my attic. There are nice pics in http://www.homedepot.ca, look for “Sharkbite Coupling”.